If you’re going to take the time to read a book, why not interact with it in the process? By marking up the book as you read it (or – if that’s a sin to you or the book’s on loan – adding notes on a separate piece of paper) you get to have an ongoing conversation with the author of the book over the course of reading it. In addition to the standard procedures of underlining important passages and writing comments in the margins, I recommend developing a keyed set of icons that you can quickly sketch in the margins so that it’s easier to find certain types of ideas down the road. 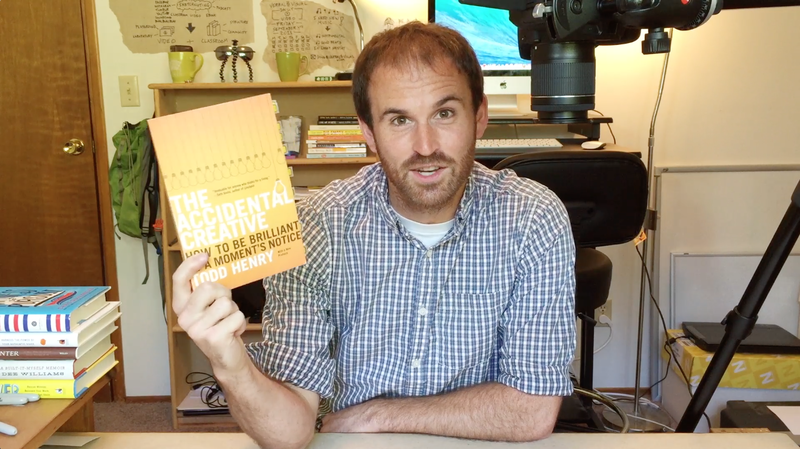 For some examples of how I used those icons while reading Todd Henry‘s first book The Accidental Creative, check out the video above. What icons would you add to your key and how would you use them? If you’re new to the idea of sketchnoting and excited to develop more visual thinking tools, I think you’d enjoy our foundational course An Introduction To Visual Note-Taking. If you’d like to make sketchnoted videos like the one you saw here, we’ve got a course for that too! Check out How To Make Sketchnote Videos. And if you’re an educator interested in bringing visual note-taking into your classroom, check out Sketchnoting In The Classroom.